My Paleo Pot Roast is a firm family favorite and I think you’ll love it too! I have instructions for how to cook it in the oven, slow cooker, and pressure cooker. 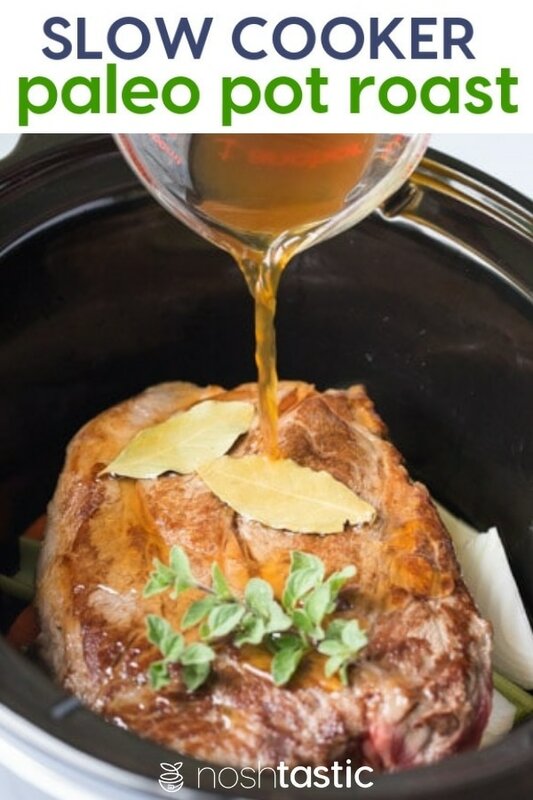 Here’s my step by step guide cooking a Paleo pot roast in the slow cooker. 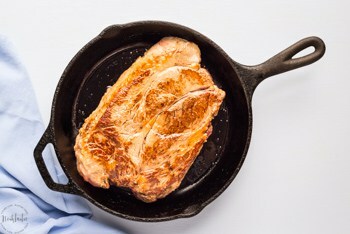 Step 1 – Brown your chuck roast in a large cast iron skillet on both sides. 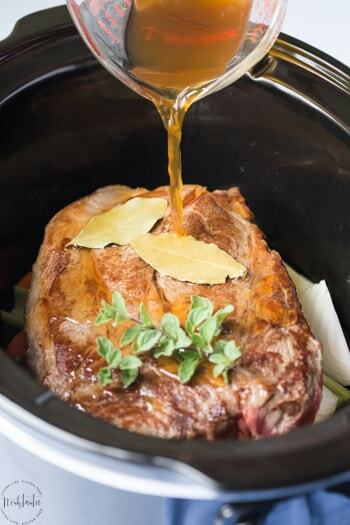 Step 2 – Add the onions carrots celery Thyme and bay leaves to the bottom of your slow cooker, then place the meat on top. Step 3 – Season the meat with salt and pepper and rub garlic over the top, add bay leaves and herbs, then pour over the beef broth or water. Step 4 – Cook the meat on the HIGH setting for 3 – 5 hrs, or on the LOW setting for 6-8hrs, or until done. 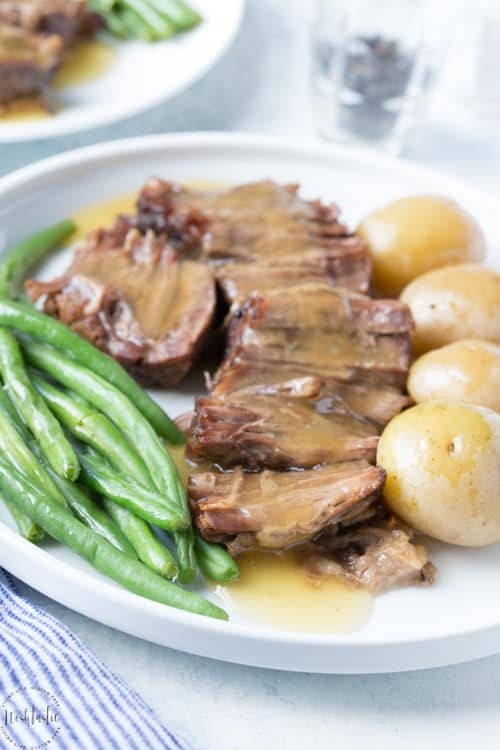 What is the best cut of meat for a Paleo pot roast? In general, tougher cuts of meat work best for making a Paleo pot roast recipe. These are the cuts of meat that contain a decent amount of fat throughout and connective tissue, so if they were grilled, fried, or cooked quickly in some other way they would be too tough to eat. My favorite, no fail, piece of beef for cooking a pot roast is the humble chuck roast. This cut comes from the shoulder of the animal and is fairly inexpensive compared to some others. Do you have an Instant Pot yet? I love mine and it’s a really easy way to cook a Paleo pot roast in under an hour. I still like to saute mine in a cast iron skillet before I cook it and then I add it to my Instant Pot and cook it for up to 60 minutes. 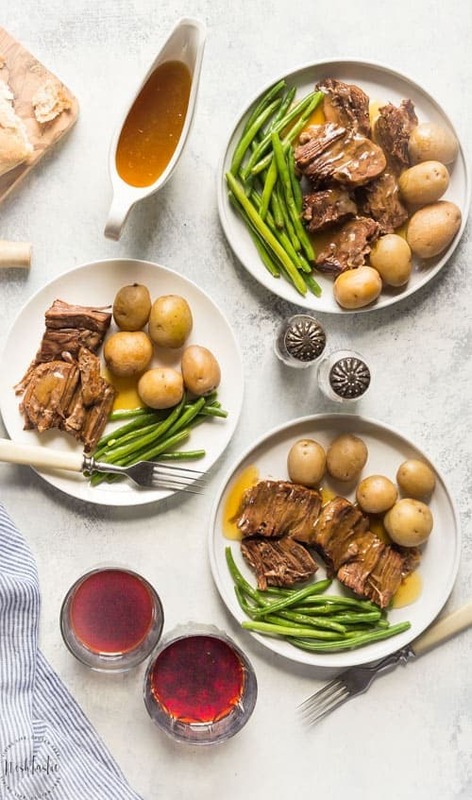 I have full details on everything you need to know in this Instant Pot Pot Roast recipe over on my Gluten Free Pressure Cooker blog. Sear the chuck roast on both sides to get a nice golden brown crust. I use an enameled Cast Iron Dutch Oven if I cook my Paleo Pot Roast in the oven, I think this is my favorite way to cook it if I’m being honest. Briefly remove the meat to a plate, and add the prepared vegetables, garlic and herbs to the base of the pan, and add the meat back on top, then pour over the beef broth or water, season with salt and pepper. Put the lid on your Dutch Oven and put it into the oven, It will take between 2.5 – 3.5hrs to cook depending on the size of your meat and the oven temperature. The gravy is very easy to make. If you can’t find any Whole30 or Paleo compliant Beef Broth then I would just use water instead, you’ll still get a nice flavored broth for your gravy by the time the meat is cooked. First, pour off the broth from the cooked pot roast and put it into a pan on the stove top. Then mix the arrowroot with two tablespoons cold water. Tapioca Starch works too. Add half the arrowroot liquid to the pan with the gravy and stir on a medium heat until the gravy is thickened, if you need it thicker add some more of the starch mixture. If you are using arrowroot it will thicken it just like cornstarch will, but I have found it can sometimes create lumps in the gravy, if that happens simply pour the gravy back through a sieve, and serve! Here are some of my favorite Paleo Dinners, but first Paleo Dessert! I know you’ll love these Paleo Whipped Gluten Free Shortbread Cookies from Food Faith Fitness, they’d be perfect to have after dinner with a hot drink! Or, how about these no bake Paleo Pecan Bars from Beaming Baker, they look really tasty and super easy to make. 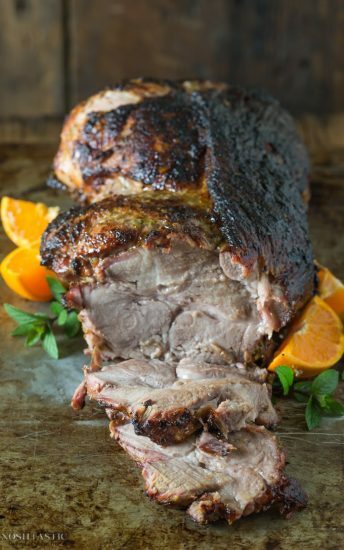 My Paleo Cuban Pork Roast is a fantastic recipe that I know you’ll love, it’s well worth the wait! 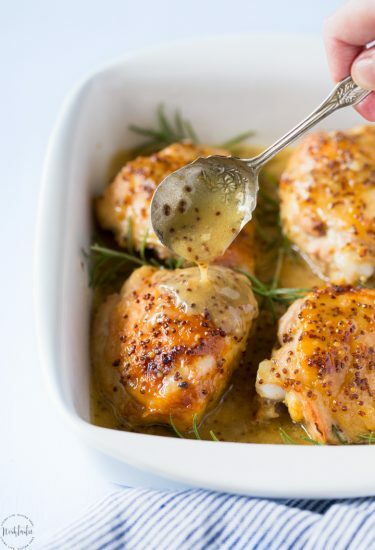 My family love my Paleo Honey Mustard Chicken and it’s a very simple recipe to make. 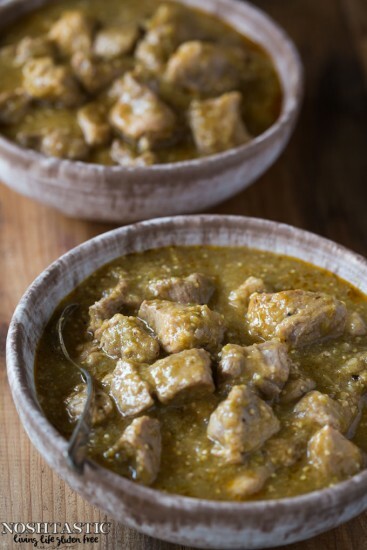 If you’ve never tried my Easy Paleo Chili Verde then you need to go get the ingredients and try it right away! 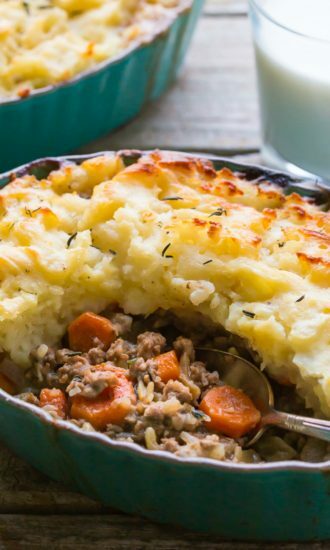 Always in my top five posts, my Gluten Free Shepherd’s Pie is classic comfort food. You can make it with beef of lamb. 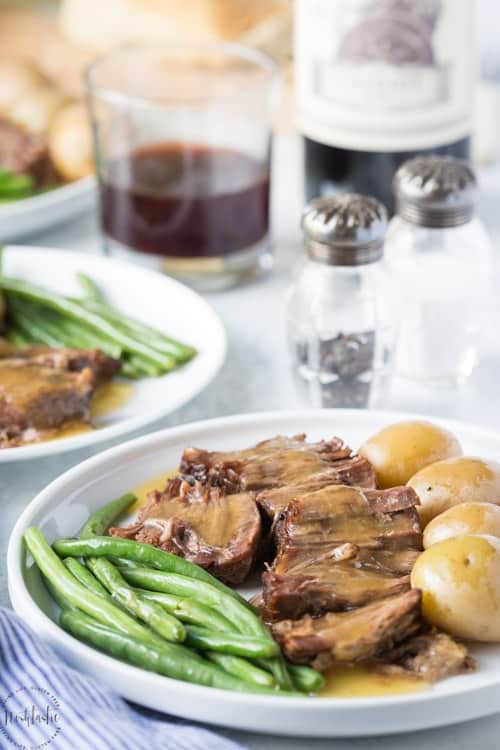 The ultimate in easy slow-cooked comfort food, this Paleo Pot Roast will be sure to please your whole family! Use a large oven proof pan with a lid, such as a Dutch Oven. Add a little oil over a medium/high heat and sear each side of the chuck roast. It will take between 2.5 - 3.5hrs to cook this in the oven, depending on the size of your meat and the oven temperature. Brown the meat on both sides in a large Cast Iron skillet with a little olive oil. Add the prepared vegetables, garlic and herbs to the Slow Cooker, and put the meat on top, then pour over the beef broth or water, season with salt and pepper. Cook the meat on the HIGH setting for 3 - 5 hrs, or on the LOW setting for 6-8hrs, or until done. After the meat is cooked, pour off the broth from the pot roast and put it into a pan on the stove top. Add two tablespoons of arrowroot or tapioca starch into a small bowl and mix with two tablespoons cold water. Add half the arrowroot liquid mixture to the pan with the gravy while it's off the heat and stir it in. Then cook it on a medium heat until the gravy is thickened. if you need it thicker add some more of the starch mixture and proceed as before. If you are using arrowroot, it will thicken it just like cornstarch will, but I have found it can sometimes create lumps in the gravy. If that happens simply pour the gravy back through a sieve, and serve. PALEO BEEF BROTH - this is hard to find in regular grocery stores, for this recipe you can use water but the gravy will not be quite as rich. I like Kettle and Fire Bone Broth from Amazon. 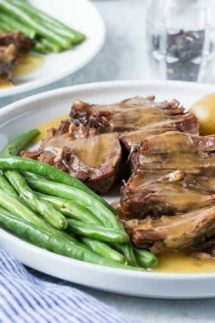 SLOW COOKERS - One last thing, I have found that you can easily overcook a pot roast even in a slow cooker. What typically happens is that the meat can become dry, stringy, and lose flavor as all the flavor goes from the meat into the liquid, so you end up with pretty tasteless meat and a fabulous gravy. Some slow cooker run hotter than others so don't over cook it! 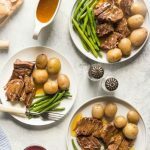 The perfect dinner – It has been a while since we had a crockpot roast but yours looks so juicy and tender – I will be craving it now! I have overcooked several recipes in the slow cooker – it can be done! Yes, I’m really bad at overcooking slow cooker meals! Many recipes overestimate the time it takes to cook meat in a slow cooker, at least the way I like it! Love how comforting this looks, especially with our colder temperatures here! 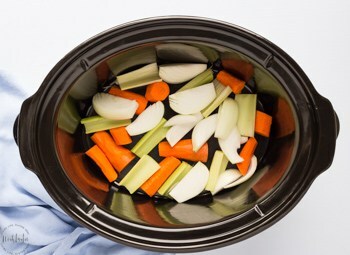 Our slow cooker has a built-in thermometer so that has helped greatly with meals like this. I love pot roast, such a comforting dish. That it is paleo and whole30 is fabulous. Braised beef served over sweet potatoes is my idea of heaven! Pot roast is the first dish I look forward to when the weather gets cold. This looks fabulous! Thanks Valerie, it worked really nicely with the sweet potatoes! You can tell how delicious and tender this pot roast is just by looking at it. It’s beautiful! Thanks so much, it cooked up really well this time! I always loved that version of a pot roast when I was a kid. But now I love this one even more. So much great flavor, and I know everything that is in it! Thanks Erin, the canned soup pot roast was one of the first meals we had when we moved here, my kids still love that version! Love, love, love the photography! Beautiful props and gorgeous lighting!! Mmm, I love a good pot roast! Especially one without a bunch of funky ingredients! This looks delicious! You’re right there’s not onions, celery, or carrots in the picture of the cooked pot roast as my personal preference is that I don’t usually eat the vegetables (with the exception of potatoes) that have been cooked with the pot roast as they are really soft after cooking for a couple of hours and most of the flavor has gone into the gravy, I served mine over mashed sweet potatoes instead. This looks delicious – definitely putting into my menu plan this week. One thing though… usually if you’re paleo, potatoes are a no-no. Essentially, white potatoes aren’t paleo because they’re starchy vegetables and have a high glycemic index. Thanks Amanda! I know there’s a lot of back and forth on whether potatoes are paleo and it really depends what Paleo expert you ask, even Mark’s Daily Apple hasn’t ruled them out and they are now approved on the Whole30 diet too. My take is that eating them like this with meat and other vegetables means that the glycemic load is reduced so it’s not an issue for most people, but if it is they can easily swap them for another vegetable. I was excited as I read the buildup to the recipe, only to find that this is absolutely NOT whole30 compliant. No cornstarch. And I’ve yet to find a beef broth on the market that is compliant. Hi Jake, I’m sorry you’re disappointed with the recipe. I know cornstarch is not paleo or whole30 compliant which is why I list arrowroot as an alternative. I agree that it’s hard to find whole30 compliant broth on the market, I tend to just make my own when I’m following whole30. Hi, this looks very good. Could I sub veggie or chicken broth instead of beef? Doing whole 30 and it is hard to find the right beef broth. Thanks. Hi April, I hear you on the beef broth, I found it hard to find any when I was on whole30 and ended up making my own but I know that’s a bit of a pain to do. I think chicken broth would *probably* be ok but I’ve never used it with pot roast. You could just use water but it may not be quite as rich as using beef broth but it will still taste great with all the other flavors in there, I’ve made it with water many times. So you don’t think the vegetable stock would work? Hi April, sorry I missed your question about veggie stock, yes that would work too! Would it be possible to cook this longer on low? I would love to leave it while I go to work and 3-5 hours is not long enough. Stephanie, have you tried this recipe on the low setting? I’m thinking about making this as a surprise for my boyfriend’s birthday, but I’m at work all day and don’t want it to overcook and ruin the birthday dinner! I’m just curious if you’ve had success with this. Any help/tips are appreciated! This sounds delicious. So I’m wondering about the potatoes. Are the small potatoes in the recipe sweet potatoes? Do you put the sweet potatoes in with the roast and then mash them up after? Thanks! Hi Shelly, I’m sorry for the confusion about the potatoes, I updated the recipe. You can do either. If you do sweet potatoes I would boil them separately and mash them, I would be afraid they would just turn to mush if you cook them with the meat, regular small potatoes are fine in the slow cooker though. Just found out about your blog, and I’m so excited to try some new recipes! I made this roast the other night, and we all loved it! This looks delish!! I cannot wait to try. I make something very similar to this all the time but never thought of using the drippings and thickening for a yummy gravy! Hi Ashlyn, the gravy is really lovely and makes the dish, I hope you’ll try it! How much roast is needed? Is it 1.4 lbs? Hi Erika, I’m sorry it wasn’t very clear I’ve updated it a little, it’s one 4lb roast, but you could use any roast size between 3-5lbs and it would work just fine. Are the nutrition facts for the entire recipe? If so, how many servings does this make? Hi Kathryn, the nutrition facts are for all ingredients listed and are based on six servings. Hi, do you cut up the potatoes? Hy Chad, I usually use baby potatoes, so if they are bigger than that I would cut them up. I am wanting to make this this weekend for dinner but I do not have arrowroot, what can I sub for it? Thank you! Hi Kristie, sorry for the delayed response, I’ve been out of town. You can also use tapioca starch, or potato starch to thicken it, or if you are not following paleo or whole30 cornstarch works too. For Whole30 , I’ve been using Pacific Organic Mushroom Broth. I’ve got it In with my roast right now. ???? Was having company over and it was a mixed group of paleo/not paleo folks. This was the perfect recipe! Everyone loved it. Thanks! Wonderful Meghan, I’m so glad you liked it! Looks great! Any idea as to a conversion from slow cooker to pressure cooker? Thanks! I made this twice within two weeks. I absolutely love this recipe and so does my family. When I first saw the sweet potato I was like whoa….no way! Well I tried and OMG, it is amazing and wish I had found this recipe years ago! I made this recipe using the crockpot directions. The flavor of the meat was good but I felt it was too dry. The next time I make this, I would put the vegetables on top of the meat so it sits in the stock instead of above it. Perhaps it cooked too long but I don’t think so. I used a 3.5 lb roast and cooked it on low for 7 hours. Another option may be to add more stock. Thanks! Hi Matt, I’m sorry the meat was dry, usually that’s because it has cooked too long so I would check it between 5-6hrs next time and see how that goes as some slow cookers run hotter than others so maybe yours does not need 7hrs to be ready. The beef that I buy comes with string tied round it—do I cut it off? Hi Jade, I’d leave the string on until it’s cooked otherwise it will fall apart, do make sure it’s a cut of beef that will work for slow cooking and you should be good to go! Haha will do! I want the beef to fall apart like in the pivot re.. Growing up thats how my grandfather’s pot roast was and I want it to be like that so fingers crossed. Hi, this looks very good. But I made this recipe using the crockpot directions. The flavor of the meat was good but I felt it was too dry. The next time I make this, I would put the vegetables on top of the meat so it sits in the stock instead of above it. Perhaps it cooked too long but I don’t think so. I used a 3.5 lb roast and cooked it on low for 7 hours. Another option may be to add more stock. Thanks! Hi! Do you think this would work if my chuck roast is 2.5 lbs? Just reduce cooking time a bit? Hi Jill, yes it will work with a smaller pot roast for sure! Check it after 2.5hrs in the oven, or 3hrs on high in the slow cooker and see how it is at that point. It may not bee cooked as tender as you like it at that point but you should then have a wee bit more idea of how much longer it needs. Hello Sheena. Sounds awesome. I plan to make a few small adaptations to make it AIP compliant. Quick question: I see several pot roast recipes that say to put the veggies in the pot first and place the browned and/or seasoned beef on top of the veggies. When I buy a chuck roast there is always a thick padding of fat on it. Do you cut all of the fat off first? Most of the fat? I wouldn’t be asking the question really except the instruction to put it on top of veggies. The post roast I’ve been making for many years has no veggies in the pan. Only the roast and “savory pot roast for slow cooker seasoning” (pre AiP or paleo days) and water. Also I saw another comment from someone about the veggies where you say you don’t want them as soft as they end up. So you are just discarding the veggies when done? I hope you can make this work for your AIP diet. So yes, the vegetables are really only there to make or enhance the stock that the meat makes, it’s much more flavorful with a few pieces of onions and celery thrown in there than just beef broth or water – though that will cook it just fine too, but the gravy will have less flavor. And I like to put it on top of the vegetables so that they are immersed in the liquid, and so that the meat is not, but you can do it whatever way you prefer really, it will still cook the same. And I do discard those few vegetables when done mentioned in the recipe that are only there for making the stock (onions, celery, and a couple carrots) If you don’t want to use all those veggies then you’d still get some added flavor from an onion and a stick of celery. If you want to eat the carrots you’d need to add them in nearer to the end of the cook time – not sure exactly how long they would take to cook as it depends on how soft – or not soft – you want them. Does that help? Oh, and the fat on the meat. I always use a grocery store chuck roast and it doesn’t usually have a ton of fat, some around the edges but that’s it. I never take the fat off unless I get one that has an unusually thick piece of fat on it I might trim it, but not usually. I think the fat helps the meat cook up nicely, helps prevent it drying out, and it adds flavor. I will take the remaining fat off when the meat is cooked and I’ll skim most of the fat off the gravy liquid once it’s all done.